Bioactive substances recovered from plants and natural products are of great interest in cosmetic, pharmaceutical and food industries. Why installing the ROTOCAV hydrodynamic cavitator for the extraction of bio-components from plants, roots, flowers, seeds and natural matrices? Traditional methods of extraction are distillation, solvent extraction and cold compression, but they require long processing time, large amounts of solvents and some of the main drawbacks are partial loss of volatiles and degradation of the target molecules. Cavitation or “cold boiling” effect enhances mass transfer avoiding heating of the bulk and thermal degradations. The mechanical effect of hydrodynamic cavitation promotes the release of bioactive substances from the plant matrix by disrupting cell walls and by promoting solvent access to the cell content. Which natural matrices can be treated with the ROTOCAV hydrodynamic cavitator? The ROTOCAV cavitator is highly versatile: it is able to process all types of natural matrices, ensuring high performances in terms of yields of extraction. Extraction of bio-components and aroma from herbs, natural products, spices (such as vanilla, wormwood, passion flower, black tea, chamomile, cranberry, maté, guarana, pepper, garlic, ginseng) or preparation of infusions. 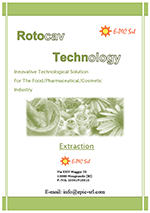 Which are the main advantages I can achieve by using a ROTOCAV hydrodynamic cavitator in the field of extractions from natural products? The main advantages due to extractions assisted by hydrodynamic cavitation are time saving, higher active principle concentration in extract, yield improvement and operative cost saving. What is the best installation of the ROTOCAV hydrodynamic cavitator for the extractions from plants, roots, seeds, flowers and natural products? 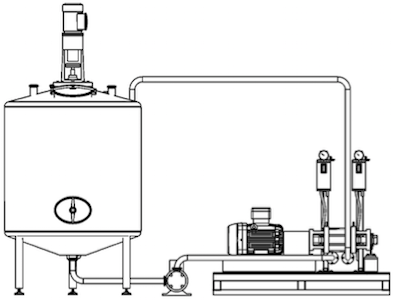 The installation of the ROTOCAV hydrodynamic cavitator for extractions from natural matrices is easy and quick, as it can be integrated in existing plants, for example in a loop to a stirred tank: in this case, the ROTOCAV cavitator operates in batch or semi-batch mode. The recirculation pump is designed to ensure a statistically specific number of passages of the fluid to be treated into the cavitation chamber. E-PIC S.r.l. designs and provides hydrodynamic cavitation assisted extraction plants according to customer needs.